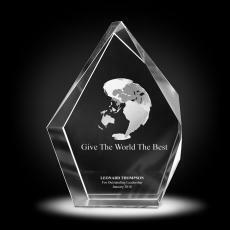 Exclusive 3D Crystal Awards with 3D engraving suspended inside 100% crystal clear awards. These recognition trophies have a unique recognition award. Really like how this product looks - especially with a custom-engraved message. Gave this as part of an employee anniversary gift and everyone thought it was awesome, including the recipient. Expected to be a little larger, but too large would be gaudy.